It's Labor Day 2009, but it feels more like 1983. That's the last time such a large percentage of America's work force was unemployed. 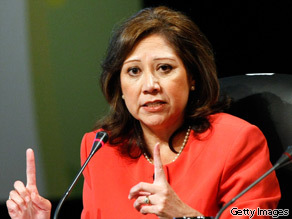 Department of Labor Secretary Hilda Solis urges the unemployed not to become discouraged. The nation's jobless rate of 9.7 percent is troubling enough but it dramatically understates the real depth of the problem. There are between 25 and 30 million people in this country who are ready, willing and able to work full-time, but can't find work. Think of that – in the world's most powerful economy, the size of the out-of-work population is slightly more than that of New Jersey, South Carolina and Illinois combined. Here's how it breaks down. There are 14.9 million classified as unemployed. Another 9.1 million are considered "under-employed" – meaning they want full-time work and are actively looking for it but have settled for part-time work instead. Yet another 2.3 million are called "marginally attached" to the work force. They are ready and able to work and looked for a job sometime in the last year but stopped looking in the last four weeks. They are not counted in the nation's unemployment rate. And of those "marginally attached," there are 758,000 "discouraged" workers, who have simply stopped looking for a job because they think there is no work for them. Among those who are not counted: Stay-at-home moms who need to go back to work to feed their families. Discouraged workers who have struggled to find employment since the last recession ended in 2003. Those who have already retired, but have not worked in several years, and now must go back to work because their home values have dropped and their savings plans have taken a hit. Add up the uncounted and those who are counted, and that's 26.3 million workers. Those are the faces not even counted in the unemployment rate. Within the jobless numbers, there are hundreds of thousands of new college graduates entering the job market for the very first time and entering it unemployed. There are factory workers and roofers and retail clerks and bankers. There are small business owners who have held on through two grueling years but couldn't keep their businesses going any longer. There are music teachers and guidance counselors and school aides axed by school boards because budget cuts mean something has to give. And the group with the highest percentage unemployed are teenagers. Teen unemployment now tops 25 percent, a record high. It's a major political challenge for this White House. A group of scientists in Florida is trapping black bears. They're hoping to learn more about how they live and feed. The goal is to protect the animals, improve their quality of life and hopefully keep them out of people's backyards. As CNN's John Zarrella reports, the hunt involves high-tech GPS collars – and low-tech desserts. After a summer of town halls, the time for talk is about over. Congress gets back to work this week and we're focusing on the "independent voices" – leaders that could reshape the debate in Washington and help unite, rather than divide the nation. John Avlon, independent analyst and columnist at the DailyBeast.com, joined us to highlight two lawmakers who are putting partisan politics aside. WASHINGTON (CNN) - The resignation of Obama administration figure Van Jones, following controversies over a petition he had signed and his comments about Republicans, did not come at the request of the president, the White House senior adviser said Sunday. 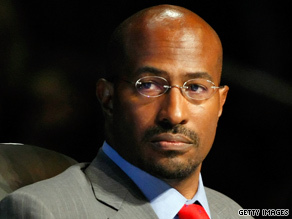 Van Jones attends the National Clean Energy Summit in Las Vegas, Nevada, in August. "Absolutely not - this was Van Jones' own decision," David Axelrod told NBC's "Meet the Press" when asked if the president had ordered the resignation. The chairman of the House Republican Conference, Rep. Mike Pence of Indiana, had called for Jones to resign or be fired. "I think Van Jones did the right thing," Pence said Sunday about the resignation. "His extremist views and coarse rhetoric have no place in this administration." Jones has frequently been dubbed a "green-jobs czar" for the administration. "The president should suspend any future appointment of so called czars while the administration and the Congress carefully examines the background and qualifications of the more than 30 individuals who've been appointed to these czar positions," said Pence, speaking to reporters. "And the Congress ought to initiate a thorough inquiry into the constitutionality of this practice which has spanned Republican and Democrat administrations." In a statement Saturday night, the White House said Jones was giving up his post at the Council on Environmental Quality, where he helped coordinate government agencies focused on delivering millions of green jobs to the ailing U.S. economy. If you check your bags when you fly you paid the airlines a half a billion dollars for that convenience in the first three months of this year. It's a convenience that used to be free, and that's just the beginning. CNN's Carol Costello has the story. (CNN) - The Massachusetts Division of Marine Fisheries has tagged two great white sharks off Cape Cod in an area where shark sightings have been reported, state officials said Sunday. 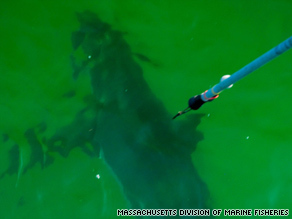 A great white shark is tagged Saturday off Cape Cod, Massachusetts. Shark sightings closed nearby beaches. The first tagging Saturday marked the first time a great white shark had been successfully tagged in the Atlantic Ocean, the division said in a statement. A second shark was tagged Saturday afternoon, officials said. The taggings took place in the waters near Chatham, Massachusetts, two days after Greg Skomal, shark expert for the Division of Marine Fisheries, reported as many as five large sharks were seen near Monomoy Island, a National Wildlife Refuge off the southern elbow of Cape Cod. The island is about a mile away from Chatham's Lighthouse Beach, a public swimming area. Chatham's beaches were closed to swimmers after the sightings, Skomal said. CNN affiliate WCVB reported that all of Chatham's east-facing beaches were closed after three sharks came within 75 yards of the coastline. The beaches will be off-limits to swimmers until the middle of the week, officials told WCVB.